Editor’s Note: This article is the second in a series on the Uniform Law Commission. The first article was posted on August 6, 2015. The Uniform Law Commission (ULC), formerly known as the National Conference of Commissioners on Uniform State Laws (NCCUSL), was created as an offshoot of the American Bar Association in 1892. Since its inception, ULC commissioners have drafted more than 300 uniform and model acts. The ULC process is intentionally deliberative and open and designed to include many opportunities to question and discuss each proposed law — long before the law is considered ready for proposal to state legislatures across the country. The ULC’s procedures are meant to ensure the meticulous and transparent consideration of each uniform and model act. Generally, each uniform and model act requires at least four years of development before the ULC adopts it, and it is not unusual for the work to take longer. After a proposal is studied for at least a year and approved for drafting, a Drafting Committee spends at least one year, and often two years, drafting and redrafting. Then the full ULC must consider the draft at a minimum of two annual meetings. The ULC draws on its commissioners’ expertise throughout the drafting process and welcomes input from legal experts, advisors, and observers representing the views of other legal organizations or interests. The process for developing uniform and model acts starts with the ULC Scope and Program committee, which considers proposals and suggestions for new uniform or model acts from a variety of sources. Past sources have included bar associations, state government entities, private interest groups, uniform law commissioners, and private individuals. The Committee on Scope and Program may assign a suggested topic to a Study Committee, which then researches, reviews, and reports back on the proposal. The Committee on Scope and Program reviews all Study Committee recommendations and then makes final recommendations to the ULC’s Executive Committee regarding which proposals may be desirable and feasible to become uniform or model acts. If the Executive Committee approves a recommendation to create or amend a uniform or model act, a Drafting Committee is formed from the roughly 400 ULC commissioners from around the country and a reporter-drafter – an expert in the field – is hired to assist the committee. In addition, advisors from the American Bar Association and other participating observers are solicited to assist every Drafting Committee. Each draft act receives a minimum of two years of consideration. Drafting Committees meet throughout that period to use the expertise of the state-appointed commissioners, stakeholders, and other legal experts and observers. The Drafting Committee rewrites and reconsiders the draft as often as needed before the committee decides to bring the draft to the annual meeting of commissioners. Tentative drafts are not submitted to the entire ULC until they have received extensive committee consideration. How does an act receive final ULC approval? Draft acts are submitted for initial debate by the entire ULC at one of its annual conferences, usually held in July. Each act must be considered section by section, at no fewer than two annual meetings, by all commissioners sitting as a Committee of the Whole. With hundreds of trained eyes probing every concept and word, few drafts leave an annual meeting in the same form as initially presented. 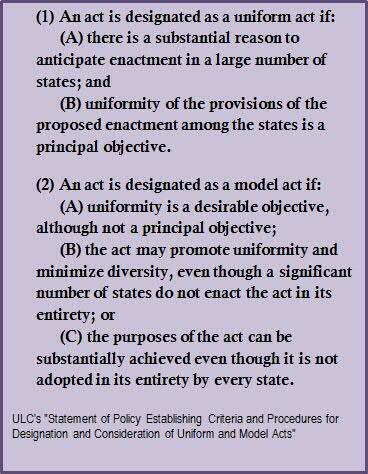 Once the Committee of the Whole approves an act, it still must pass a “vote by the states” to be officially approved as a uniform or model act. Each of the 53 state and territorial delegations polls its members and then casts one vote per delegation. To pass this vote, the proposed act must be approved by either 20 delegations or a majority of the states and territories present at the conference, whichever is greater. Once the act passes the final vote of the states, the act is considered finalized and ready for consideration by the states and territories. The ULC urges legislatures to adopt a uniform act exactly as written to promote uniformity in the law among the jurisdictions choosing to adopt the act. Model acts, however, are designed to serve as guidelines for legislation that states and territories can borrow from or adapt to suit their individual needs and conditions. In addition to legislatures, the ULC usually presents ULC-approved acts to the House of Delegates of the American Bar Association for its endorsement. ULC information about uniform acts, drafting projects, committees, and meetings and legislation information is available on the ULC website. The CCUSL is scheduled to meet on October 20, 2015, to continue discussing potential legislation for the 2016 session. CCUSL meeting schedules and agendas are available on the CCUSL website.